3 Ways to Wow Your Guests with Show-Stopping Invitations - Inspired Paper Co. Your wedding invitations are your guests first glimpse into your big day. Will your ceremony and reception be all glitz and glamour? Will it be full of rustic charm? When your guests receive their invitation in the mail and open that envelope, what are they going to see? The invitation is your first opportunity to set the tone for your big day. Whether you are having a casual outdoor wedding or a more formal affair, it should be clear to your guests. You can be sure to set the right expectations, and wow your guests with show stopping invitations by considering some of the options below. A glitter layer and belly band, paired with shimmer paper, make this invitation pop! Glitter and shimmer papers are perfect for any event. Use them to dress up a rustic theme and show that although the party is taking place outdoors, the evening will be sophisticated. If you are throwing a glamorous party, use glitter to add a little drama and showcase just how elegant the night will be. Glitter suits every style from classic to vintage to casual, and everything in between. If full-on glitter just isn’t your style, opt for a shimmer paper instead. Shimmer papers can give the same effect with just the right amount of sparkle and shine! This sophisticated, rustic invitation suite utilizes linen textured paper on the invitations and inserts, as well as our favorite wood grain textured folder! An inexpensive way to add a luxurious feel to your invitations is by using a textured paper. These papers are different than the standard smooth stock used on most invitations, and they add an expensive feel to your suite without exorbitant costs. Linen or cotton papers are perfect for formal, vintage, or elegant events, while kraft paper instantly adds a rustic feel. We also offer wood grain pockets and folders to dress up any outdoor or rustic themed wedding invitation. Metallic gold printing offers an unexpected twist to any invitation! Stand out from the beginning, right from the mailbox! 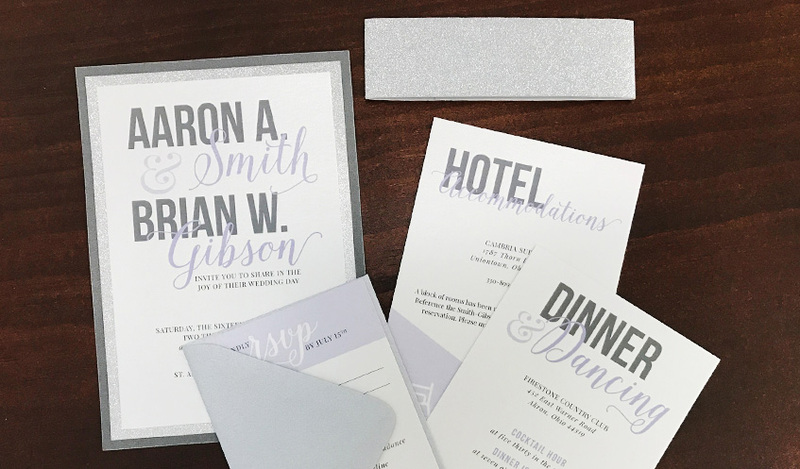 White is a great non-traditional option for addressing darker colored envelopes that will be unique and attention grabbing to your guests. You can also use white ink to print invitations on a dark-colored paper stock. Add some metallic silver, gold or even rose gold for a classic invitation with a twist! If you want your guests to feel as excited as you are about your big day, consider embossing for a tactile and interesting addition. 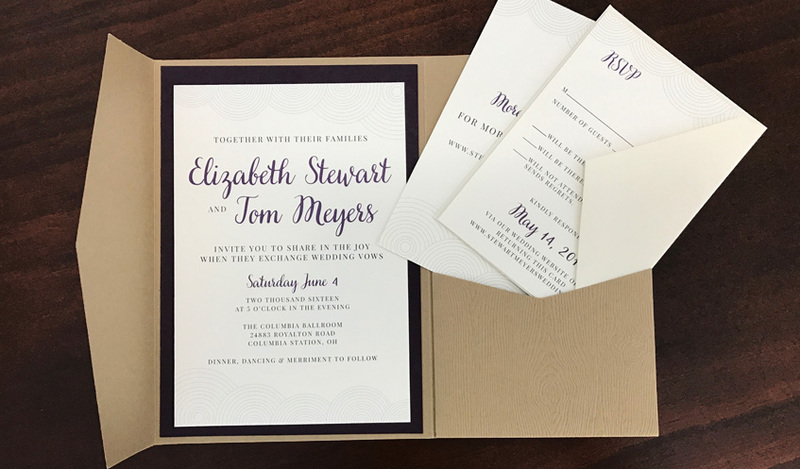 No matter the design, these techniques can be used to personalize and enhance your invitation suite! These are just a few ideas to help take your invitation suite to the next level! Are you ready to get started? Head on over to our consultation request form and let us know! We would love to chat about your big day, and all of the options you have available to you!